The Leadership Clinton 2019 class recently met at Ohio Living Cape May. 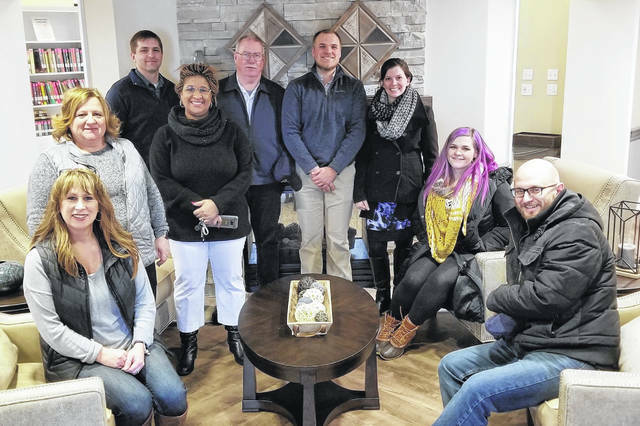 WILMINGTON – The Leadership Clinton Class of 2019 met for the sixth time on Jan. 17 at Ohio Living Cape May. The class started by discussing the community project they chose to support, Sleep in Heavenly Peace. The Wilmington American Legion gave Sleep in Heavenly Peace a generous donation of $3,500 which will be used to support a bed build by the Leadership class. We will also be reaching out to Leadership Clinton Alumni for donations and volunteers to support the build which is scheduled for March 9. Leadership from a Human Resources perspective was the topic for the morning discussions. Guest speakers were Mindy Markey-Grabill, Executive Director of HR from Southern State Community College; Munroe Fannin, HR Generalist from Southern State Community College; Anna Kissick, from Liberty Savings Bank and President of the Greater Wilmington HR Association; and Cheryl Stone, a retired HR manager for Deluxe Technicolor Digital Cinema. Some of the topics discussed were requirements for HR certification, understanding your workforce, use of social media for recruitment, conflict resolution, the importance of leadership training and dealing with volunteers as employees and the need for background checks. Everyone was given the opportunity to share some of their experiences as a leader. Lisa M. Nack of Pathway Guidance spent the afternoon with us providing feedback and training on our Leadership Practices Inventory. The LPI is a tool to help you gain perspective into how you see yourself as a leader, how others view you and what actions you can take to improve yourself as a leader. We were each given time to review our individual report. We divided up in small groups and completed an exercise on how we felt about the report and feedback on how it saw us as leaders and how we can improve. The day ended with Abby Ellsbury of Cape May giving us a tour of Cape May. We were able to see the various levels of care they offered. It included the villa and apartment homes, assisted living apartments and studios, long-term nursing care and rehab facilities. We were very impressed with what they had to offer. The next class meeting will be on Feb. 21.